De ser cancelada la reserva, se cobrará automáticamente el 100% del valor de la primer noche. Eventos Sociales, matrimonios, cumpleaños, fiestas familiares. The Pietra Hostel Camping Bungalow has more than 5,000 m2 of green areas for camping and camping bungalow, services included (WiFi, Balcony, Gym, Bathrooms, Bonfire Points, BBQ area, Showers with hot and cold water, TV room with netflix, Kitchen, Parking, etc ...) and services with additional cost with our partners in tourism (horseback riding, ATVs, buggies, jacuzzi, bicycles, tents, mattresses, pillows and tourist advice and tours). We have the house hostel service, bungalow area and camping areas equipped with campfire points, grills, parking and their respective areas of bathrooms and showers. Pietra Hostel Camping Bungalow, is located in the western mountain, 10 minutes walking from the main square, 15 minutes from the blue wells, 20 minutes from the Gondava Park and 5 minutes from the Hippodrome. We have one of the best 'viewpoints' of the colonial town. 6 bed dorm : 4 double beds in bunks and 2 single bunks capable of accommodating 6 guests. Measures 4x4 mts2, with windows and of which one enjoys a view of the historic colonial center and the mountain. 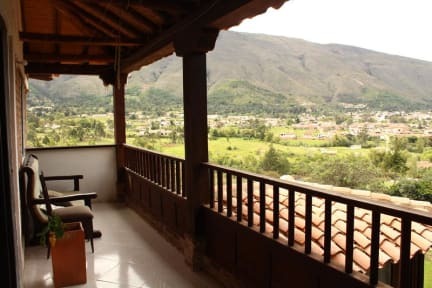 5 bed dorm with shared bathroom: Measures 3 x 3 m2, has 2 double beds and 1 single bed suitable for 5 guests, the windows give view to the historical colonial center and the mountain. Pricipal room couples with shared bathroom, measures 3 x 2 m2, double bed and with separate entrance. Master bedroom with private bathroom outside the room, measures 3 x 3 m2, room with windows that overlook the mountains and the historic colonial center. Family room for 4 people (max 6 with mats, extra charge) with private bathroom with cold water, hot water in shared bathroom, measures 3 x 3 m2, two double beds and mats, room with windows that overlook the mountains and to the historic colonial centre. Camping Bungalow : Bungalow shaped tent suitable for couples, with mattress, sheets and towels. Shared bathroom. Breakfast not included - 7000 COP per person per day.